A variety of sizes and types are available. Choose from links below to view detail. An "open top" style is used with liners to prevent material touching the sides of the container or if the fluid requires an agitator. Top Filling Reservoirs, simply remove the lid, pour in your (presumably thin) material and re-cover the pot. Open the air shutoff valve at low pressure to supply air pressure on the material, pushing it to the valve chamber. You should always use some sort of bottle or container that holds the fluid in the 2 and 5 liter pots. The larger 2 and 10 gallon models are also available with agitation devices to keep the material well mixed. Unthread the three handles mounted on the top of the tank and lift off the lid. Place an uncapped material bottle in the center of the pressure tank. 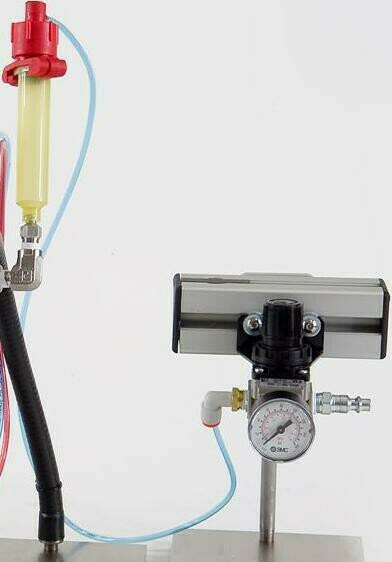 Return the lid to the top of the pressure tank while assuring the dip tube is positioned inside bottle of fluid. ​Connect the material line to the fluid delivery system. Turn the red handle 90 degrees to open the air inlet supplying pressure to the tank then adjust the regulator to the correct pressure setting and you are ready to dispense. 2 and 5 Liter Models. Estimated maximum viscosity is 25,000 cps. Intended for flowable and self leveling material. The 7011010-S = Direct Syringe Mount Reservoir For Valves Includes: Fluid Adapter, Syringe Air Adapter, 0-60psi Air Regulator & Gauge, Stand for Air Regulator and Weighted base. Does Not Include a Valve or a Valve Stand. Availability: From stock to 2 week build time. Note: Know your material! Always confirm compatibility. The 7011010-2L = 2 Liter Reservoir, regulator & gauge, is intended to be used with any IDS Valve and most valves also require a valve controller. REQUIRES A LINER - DO NOT DIRECT POUR. Most customers will use the bottle that the material comes in, set it directly inside, drop the feed tube in, and then pressurize. 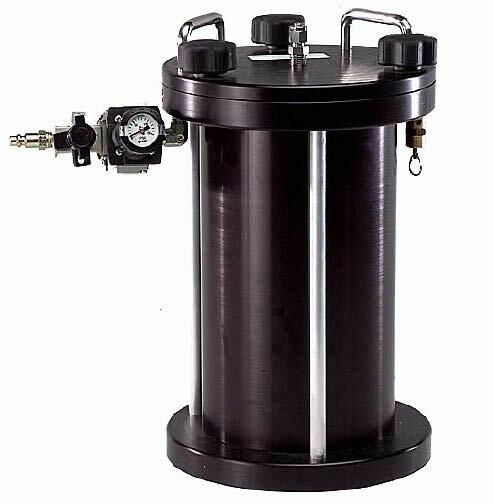 The 7011010-5L = 5 Liter Reservoir, regulator & gauge, is intended to be used with any IDS Valve and most valves also require a valve controller. 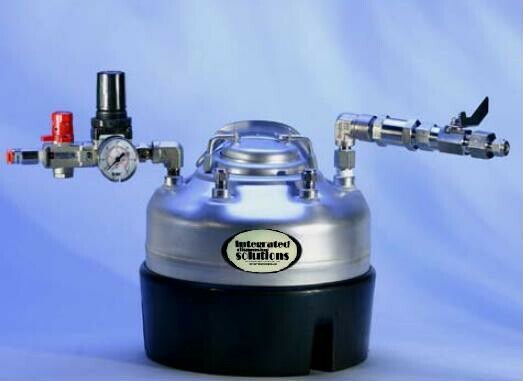 The 7011014 = 2 gallon standard reservoir, regulator & gauge, is intended to be used with any IDS Valve and most valves also require a valve controller. Intended for use with pourable and self leveling materials. ASME certified, grounding wire included​. 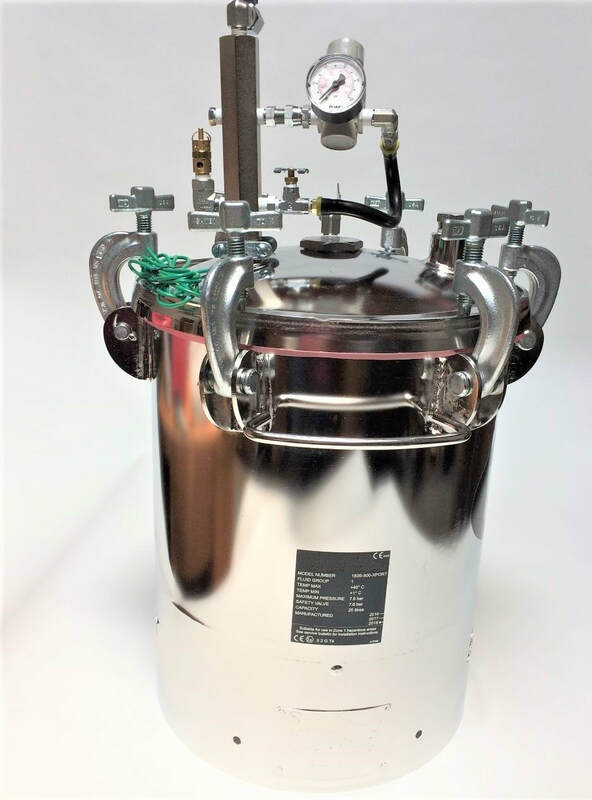 The 7011016 = 2 gallon Open Top Stainless Steel Reservoir, Regulator & Gauge, is intended to be used with any IDS Valve and most valves also require a valve controller. Intended for use with pourable and self leveling materials. Always use a liner, or place bottle or can directly in and use as liner. RESERVOIR ONLY - Shipping Included On This Item Only (Ships alone). 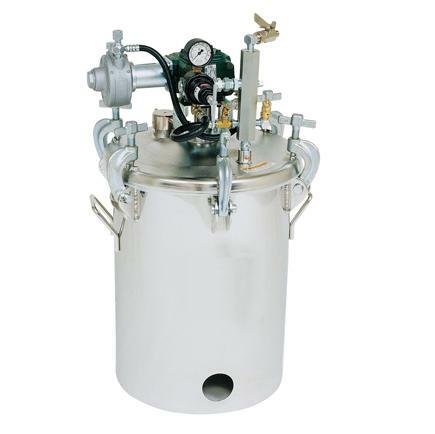 The 7011016 = 5/10 gallon SS Pressure pot - with open design with liner. The 10 gallon reservoir is designed for use with a 5 gallon (20 liter) straight wall pail, or can direct pour up to 10 gallons into liner (Actual volume is approximately 10 gallons, and may vary from 9.8 and up. )Liner included. 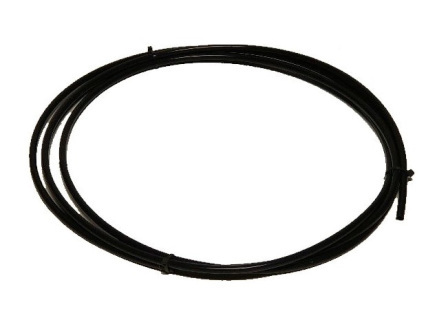 ASME certified, Pressure gauge, one liner, one gasket, material line, and grounding wire included​. Availability: 4 week build time. Need multiple units? Contact IDS directly for a quote. Note: Know your material! Always confirm viscosity and compatibility before ordering or using. 7011025 5/10 gallon SS Pressure pot - open with liners + agitator. Intended for materials that need to be agitated.